Humanetics uses a Markforged X7 to print molds for thermoset plastics. Each mold must withstand significant clamping force while heated to 220 F.
The quick turn around time, low production cost, and long lifetime of Markforged printed molds make them a excellent fit for replacing traditional thermoset molding methods. Thermoset plastics are widely used to take advantage of their strength and heat deflection temperatures. 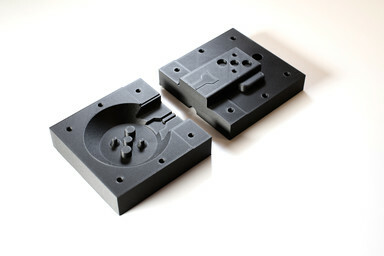 Printed thermoset molds can withstand temperatures up to 302°F (150°C) for extended periods of time with minimal distortion.